The strongest typhoon ever recorded, Yolanda, left over 100 casualties (and still counting with many news agencies predicting that it will increase up to 10,000). Also, about 2,055,630 families or 9.5 million individuals all in all are distressed (as per GMA News). And although the super typhoon already left the Philippine area of responsibility, it still devastates the country after leaving a trail of public and private property destruction and the death of many. Even everyone who weren’t directly affected is terrorized with worry for relatives who live in cities and provinces hit by Yolanda. Electricity lines are down and phone communication signals are off so you have no way to tell if relatives survived or not. In relation to that, here is something which may hopefully appease your worrisome thoughts. Yahoo! Philippines listed Leyte survivors accounted for through Leyte First District Representative Ferdinand Martin Romualdez. Do refresh the article page for updates. You may also use Google Finder and its Typhoon Yolandapage. 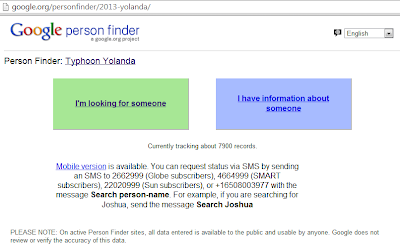 You can search for missing persons or provide information about those who have been found. You can also request for a person trace through Red Cross. Just fill out the Google docs form. Click here.